Bat Stax is the latest game from the notorious Novomatic! This slot game is Halloween-themed. Witching hour is said to be the hour after midnight – and it’s the devil’s hour! If there’s anything spooky lurking about out there, it’ll come out at witching hour. You can see all the scary creatures in Bat Stax – and more! There’s lots of darkness, magic and lots of wins! Bat Stax has 5 reels overall and 20 fixed paylines. 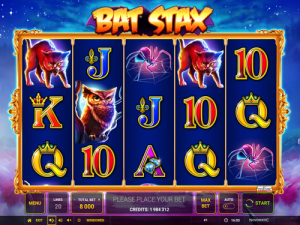 If Halloween is one of your favourite holidays then Bat Stax will be one of your favourite slots! It’s a fun video slot with a cool bonus feature that’s very unique to this game. The biggest wins are awarded when you get loads of bat stacks! The reels of Bat Stax are floating in a misty graveyard at night. There’s a full moon, lots of twinkling stars, purple fog and many gravestones. In the distance, you can just about make out the tree tops of a thick, pine forest. While there’s no other game from Novomatic that’s the same as Bat Stax, there are a few games that fans may also like. These similar slots are definitely worth checking out: Bloody Love, Vampire Fortunes, Empire V, Spooky House and Perchta. Bat Stax has a Bonus that awards Free Games. Fair warning – this slot isn’t for the faint of heart! The symbols in Bat Stax are a mix of spooky icons and casino celebrities! Whenever you play a slot game, no matter how charming the theme and the design are, you’ll always find something that gives away the game’s casino roots! In Bat Stax, this is the playing card values which appear on the reels as symbols. 10, Jack and Queen are right at the bottom of the paytable. They give equally low payouts. The King and the Ace are just above these and their payouts are slightly bigger. Larger payouts are awarded for winning combinations of the spooky picture symbols. The bat flying in front of the moon pays up to 5x your bet. The deadly spider and the ferocious cat pay out 10x your bet when you spin 5 matches across an entire payline. The wise owl, on the other hand, pays more. This smirking bird will pay 25x your bet for 5 matches on a payline. Just like in most Novomatic slot games, you can check the paytable to see all the payout information. Most symbols have payout values for 3, 4 and 5 matches. Some symbols (like the owl) also have a payout value for 2 matches. To win the payout, you need to land the required number of matching symbols on a payline. They must land consecutively from the left, following the route of a payline towards the right. If there are any gaps in the combination, the Wild symbol can step in and complete the win. It can act like any symbol (except the Bonus symbol) if it lands in the gap, of course! The Bat Stax Bonus can be very lucrative indeed! The bonus will begin when you get three bonus symbols in a spin. The bonus symbol is a carved pumpkin, lit up by a candle. For the bonus, you get 10 Free Spins and these are played on the same reels with Bat Stax re-spins! The background changes when you trigger the bonus – and you enter a dark, magical cave! The Bat Stax re-spins give you stacked symbols and free re-spins! During the Free Spins, some symbols will have a bat symbol on them. If you get two or more of these symbols to land during a Free Spin, the bats will fly across the screen and land stacked on the reels. Starting from the left, they’ll land stacked (covering all three positions) on the number of reels equal to the number of bat symbols that were spun. In addition, the bats will award a free re-spin! If more bat symbols land on the reels, the bats will fly, land stacked on additional reels and award additional re-spins! This will either continue until no more bat symbols land or you feel the whole screen with bats and get a huge win!